LONDON KY—On Friday, March 17th at 10:58 p.m. London Police received a complaint through Dispatch of a single vehicle accident on Faith Assembly Church Road. Through investigation, Jason R. Hale, 37, of Mill Creek Drive in Corbin was arrested. Upon the arrival of Ofc. Jacob Bormann, he observed a silver Jeep Wrangler in the ditch unoccupied. Ofc. Bormann spoke with several witnesses who observed Hale exit the vehicle visibly intoxicated. Once Police came in contact with Hale to speak with him, a strong odor of alcohol was detected on his breath and he appeared to be unsteady on his feet. Hale admitted to Police that he was drunk and refused to perform the standard field sobriety tests. He then was taken to the London Police Department, read implied consent, submitted to a breathalyzer test, and blew a .226. The DUI blood alcohol concentration (BAC) in Kentucky is 0.08 percent or higher. 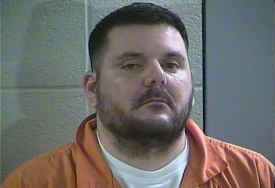 Hale was arrested, charged with operating a motor vehicle under the influence, of the first offense, and lodged in the Laurel County Detention Center. London Police now accepting applications for 2019 Citizen’s Police Academy? © City of London, KY | London Police Department. All Rights Reserved.